a herpetic involvement of the ophthalmic branch of the trigeminal nerve, which may lead to corneal ulceration. a form of herpes zoster in which the virus invades the gasserian ganglion, causing pain and skin eruptions along the ophthalmic branch of the fifth cranial nerve. There also may be involvement of the third cranial nerve. The infection frequently leads to corneal ulceration or other ocular complications. Also called ophthalmic herpes zoster. An inflammation of that portion of the gasserian ganglion receiving fibres from the ophthalmic division of the trigeminal nerve, due to an infection by a latent varicella-zoster virus identical to that causing chickenpox. The disease that occurs most commonly in people over 50 years of age begins with a severe, unilateral, disabling neuralgia in the region of distribution of the nerve. It is followed by a vesicular eruption of the epithelium of the forehead, the nose, eyelids and sometimes the cornea. The vesicles rupture leaving haemorrhagic areas that heal in several weeks. Pain usually disappears in about two weeks but in a few cases neuralgia persists for a long time. Ocular complications occur in approximately 50% of all cases of herpes zoster ophthalmicus. Corneal involvement appears as acute epithelial keratitis, which is characterized by small fine dendritic or stellate lesions in the peripheral cornea in association with a conjunctivitis. This keratitis usually resolves within a week. As the disease progresses it may give rise to mucous plaque keratitis, which occurs usually between the third and the sixth month after the onset of the rash. It is characterized by the plaque lines on the surface of the cornea, which can be easily lifted, and stromal haze. Iridocyclitis also accompanies this keratitis in approximately 50% of cases. 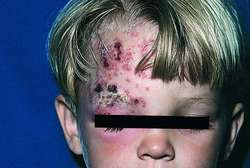 Keywords: Herpes zoster ophthalmicus, ocular, manifestation. All cases of herpes zoster ophthalmicus who attended dermatology OPD were studied from January 2012 to January 2014. Table 3 Comparison of complications in patients with herpes zoster ophthalmicus from Ethiopia, United States, Rwanda and India. Corneal complications from herpes zoster ophthalmicus. Longitudinal analysis of varicella-zoster virus DNA on the ocular surface associated with herpes zoster ophthalmicus. The outcome of patients with herpes zoster ophthalmicus. 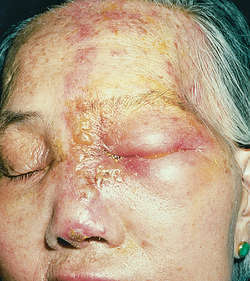 Association of herpes zoster ophthalmicus with AIDS and acute retinal necrosis.